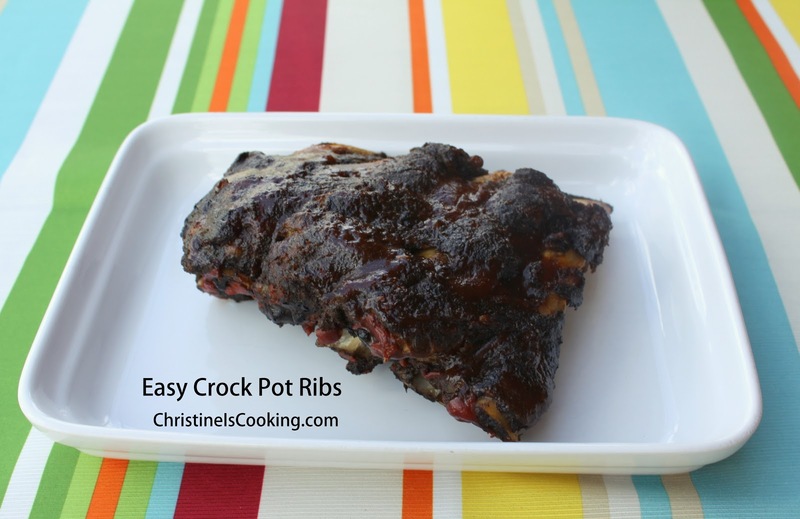 These easy crock pot ribs use a homemade dry spice rub. This rub recipe is one that I came up with based on my tastes, but you can modify it based on what spices you like and what you have on hand. Taste the rub before you use it and you can alter it to suit your tastes. We let these ribs cook all day on Memorial Day while we were out for 9 hours. When we came back home, it was great to have dinner already cooked and ready to take to the pool with us. Ribs (I used 5 lbs of beef ribs, but you can use whatever you like and in the amount you need). This rub recipe makes about 1/2 cup of spice mix and will give you plenty of rub for 5 lbs of ribs. If you are making less then that, you can save the extra rub spices for another time. It would also be good on chicken. Combine the dry spices to make the dry rub. Poke slits with a sharp knife in the back membrane of the ribs (this allows the flavors in the rub to penetrate the ribs). Rub the dry rub generously onto each side of the ribs. Pack the ribs in the slow cooker and cook 6 to 8 hours on low. These are very forgiving and can be cooked longer if needed. No liquid is needed for this recipe. After cooking, remove the ribs to a baking sheet and brush the ribs with your barbeque sauce of choice. Broil for a few minutes on high, but be careful not to burn. Tips: I like to try and place the ribs in the slow cooker vertically in a circle pattern for even cooking, but sometimes they just don't fit that way and that is okay too!